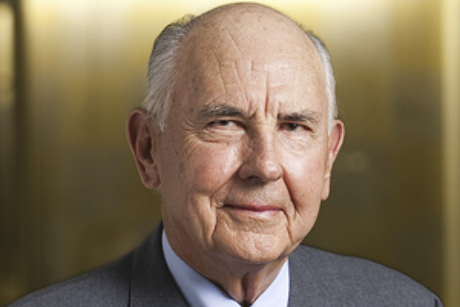 A. James Clark, former CEO of Clark Construction, died Friday at age 87. A billionaire, Clark started the prestigious Clark Engineering Scholars Program at GW and took time to mentor recipients of the award. Trustee emeritus A. James Clark will be remembered for leading the company that’s built some of the University’s most recognizable buildings and offering advice to students about his path to success. Clark died of congestive heart failure on Friday, the Washington Post reported. He was 87 years old. He served on the Board of Trustees between 1988 and 1993, and his construction company, Clark Enterprises, has built campus landmarks like Shenkman and South halls, as well as the recently opened Science and Engineering Hall. Trachtenberg also said Clark was a private, quiet person, so Trachtenberg asked Carr for advice before interacting with Clark. “He didn’t like publicity and so I tried to armor his inclinations and be as respectful to his sentiments as I could,” Trachtenberg said. Trachtenberg said one of his disappointments as president came when he and Clark tried to get a boathouse for the rowing teams on the Potomac River. Clark had agreed to cover some of the costs of the boathouse, but Trachtenberg said District zoning laws prohibited the construction. Clark Construction signs can be seen all over campus — and the company is currently building District House. Across D.C., Clark has built landmarks like FedEx Field, Nationals Park and the Verizon Center. “He served as a source of wisdom about building initiatives on which he left no fingerprints,” Trachtenberg said. Clark came from humble beginnings. The Post reported that he started out making 10 cents an hour working on his grandmother’s Virginia farm when he was a child. Because he could not afford to attend a private university, he decided to commute to the University of Maryland. He built his construction conglomerate from the ground up and was a billionaire at the time of his death. Forbes recently estimated that his net worth was about $1.4 billion. He donated $8 million in 2011 to create the Clark Engineering Scholarship program, which gives money to high-achieving engineering students. He was also donated $15 million to his alma mater, the University of Maryland, and officials there renamed the engineering school after him. Andrea Lehn, a senior majoring in biomedical engineering, won a Clark scholarship, which has given her more than $20,000 over her time at GW. The package also provides stipends for unpaid internships, study abroad trips and any expenses related to students giving presentations at conferences. Lehn said the program shaped her “academic trajectory.” It gave her a $3,000 stipend to pursue a research assistantship, where she worked on mechanical engineering projects. She will begin working toward her Ph.D. at the Massachusetts Institute of Technology in the fall. Lehn met Clark once at a luncheon with the Clark scholars where he talked about how to reach their goals, she said. “He definitely encouraged us to always continue learning, never be afraid to learn something new and to go out of your way to be correct,” she said. Liam Cusack, a Clark engineering scholar who graduated from GW last year with a bachelor’s degree in systems engineering, said he has used the scholarship to find success, one of Clark’s missions for the program. Cusack, who works at a technical research company, said he met with Clark several times over his GW career and noticed his humble personality.